There is always so much happening in Newport, and from July 9 through 15th, the Campbell’s Hall of Fame Championship will be in town at the Tennis Hall of Fame. The Hall of Fame is located just a few minutes away from the Marshall Slocum Inn, on Bellevue Avenue. 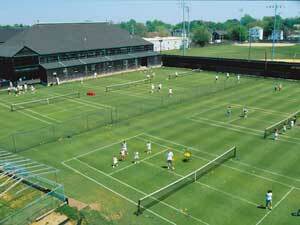 This tournament is the only professional tennis tournament in the United States that is played on grass courts. Olympic tennis team members will be competing in this tournament and it is even possible to get one on one hitting sessions with some of these “Hall of Famers.” Tickets for the matches range from $15 – $75 dollars depending on the match and type of seat. Qualifying rounds will be played on the 7th & 8th followed by the main matches the 9th-11th. Matches will begin at 11am. The quarter finals start on the 12th, after the Angela Moore Fashion Show and Champagne Breakfast, and continue until the 13th. Semifinals start at 2pm on Saturday, July 14th, after the Class of 2012 induction ceremony. This year 5 new tennis players will be joining the Hall of Fame, including: Jennifer Capriati, Guga Kuerten, Manuel Orantes, Randy Snow and Mike Davies. The event wraps up on Sunday, July 15th, starting at 10am with the Hall of Fame Classic Exhibition match, followed by a 12pm Brooks Brothers Lunch with Legends. After lunch, the tournament finals will take place, starting at 2pm, and the new Champions will take their place in history!